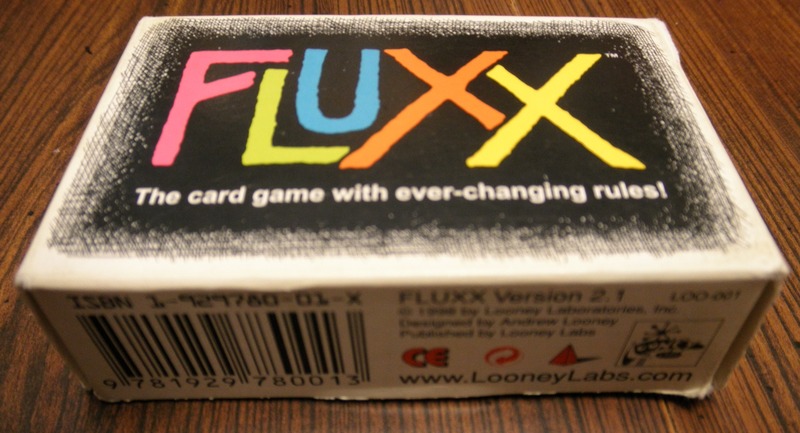 Long time readers of Geeky Hobbies should already be quite familiar with the card game Fluxx. In the past we have reviewed Chemistry Fluxx, Firefly Fluxx, Fluxx, Math Fluxx and even the Fluxx Board Game. Fluxx is one of those card games that a lot of people either love or hate. While it is not a perfect game I have always enjoyed Fluxx as it is game of ever changing rules where anyone can win at anytime. Some people don’t like the franchise though because it relies on a lot of luck and the winner can feel kind of random at times. So how does Doctor Who Fluxx compare with the rest of the games from the franchise? While Doctor Who Fluxx doesn’t drastically change the Fluxx formula, it feels like another solid addition to the Fluxx franchise. 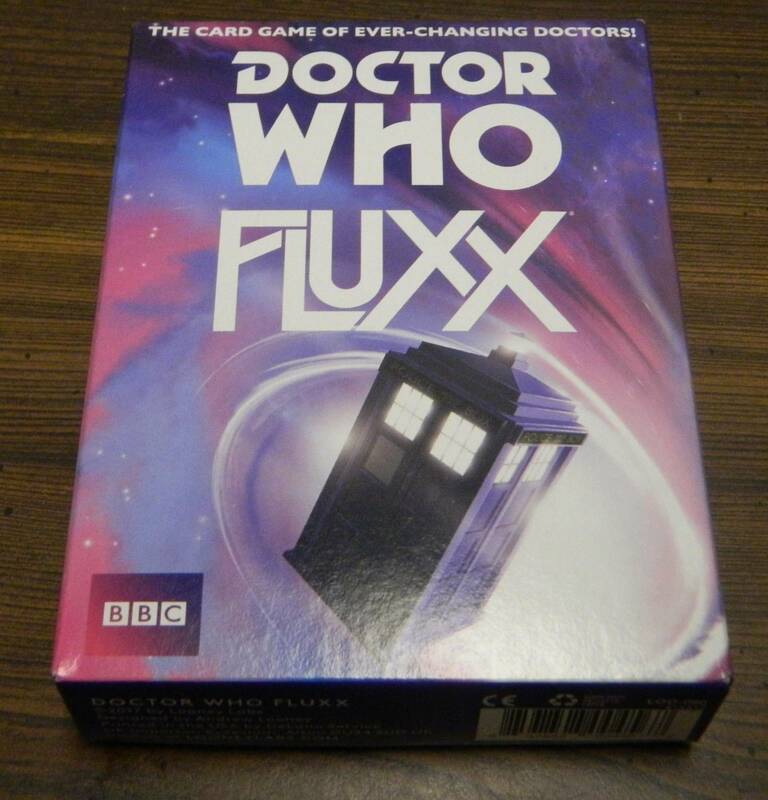 We would like to thank Looney Labs for the review copy of Doctor Who Fluxx used for this review. Other than receiving the review copy we at Geeky Hobbies received no other compensation. Receiving the review copy had no impact on the content of this review or the final score. Place the basic rules card in the middle of the table. Shuffle the rest of the cards and deal three cards to each player. Place the rest of the cards face down on the table to form the draw pile. Whichever player chooses to draw a card first gets to start the game. Draw the required number of cards. At the beginning of the game players will draw one card. Play the required number of cards. At the beginning of the game players will play one card. Discard cards to get to the required hand limit. The game begins with no hand limit. Discard keepers to get to the required keeper limit. The game begins with no keeper limit. Throughout the game players will play new rule cards which could change the rules that players have to follow. Currently there are three rule cards in play. Each player will draw four cards, play three cards, and can only have two cards in their hand at the end of their turn. New Rule: When a player plays a rule card they place it in the middle of the table. The rule printed on the card immediately goes into effect. 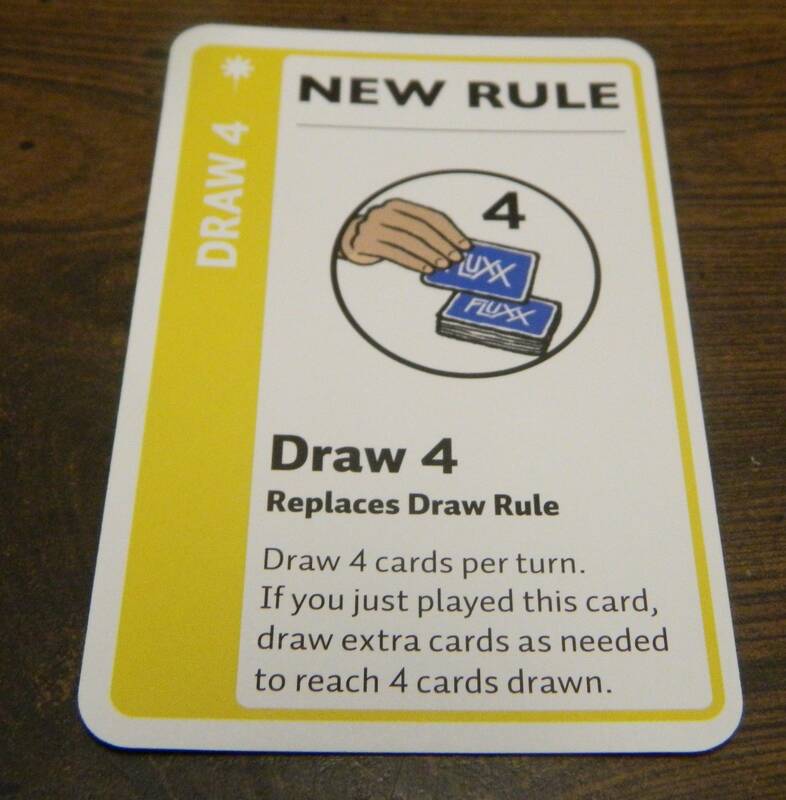 For example if the new rule has players draw more cards than they previously did, the current player will immediately draw the additional cards. If there are any rules that conflict with the new rule, the old rule(s) are discarded. Goal: When a player plays a goal card it is placed in the middle of the table and is the goal that all of the players are pursuing. If there was a previous goal, that goal is discarded. Keeper: Players will play keepers out in front of themselves. Keepers are used to help players meet goal cards. If a keeper has a special ability on it, the player can use it once the card is on the table. If a player has more keepers in front of themselves than the current keeper limit, the player must discard keepers at the end of their turn to reach the keeper limit. Any keeper that has the Doctor icon on it will work for any goal card that just requires a Doctor. Any keeper with the companion icon will work for a goal card that requires a non-specific companion. 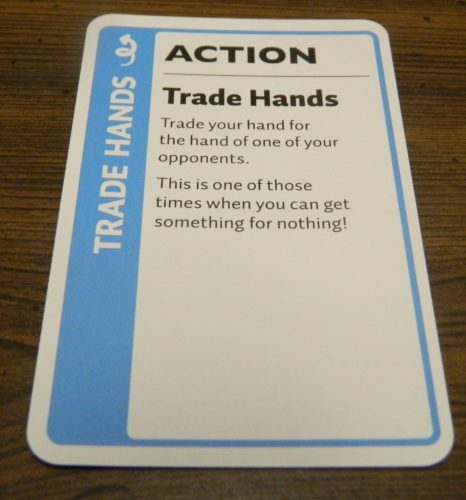 Action: An action card is played for the action printed on the card and then is discarded. Creeper: When a player draws a creeper they immediately play it in front of themselves and draw a new card. Playing the creeper does not count as a card played by the player. Unless the current goal requires a creeper or there is a rule card in play that says otherwise, a player cannot win the game if they have a creeper in front of them. Surprise: A surprise card is a card that can be played at any time. The card has two different actions printed on it. 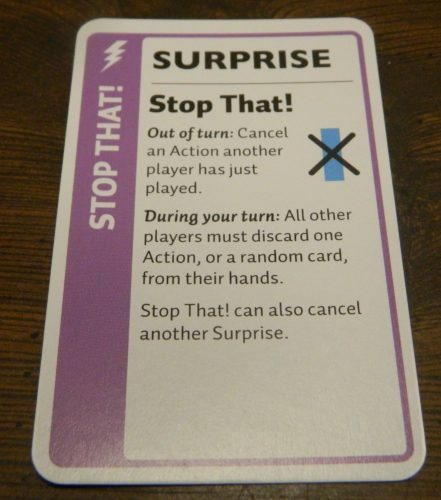 The card’s action depends on whether the card is played during the player’s turn or another players’ turn. A surprise card can also always be played to cancel out another surprise card. A player will immediately win the game if they have all the keepers/creepers listed on the current goal card in front of them. The current goal is to acquire two doctors with consecutive numbers. Since this player has meet the goal they will win the game. For those of you who have played a Fluxx game before, Doctor Who Fluxx is going to feel very familiar to you. 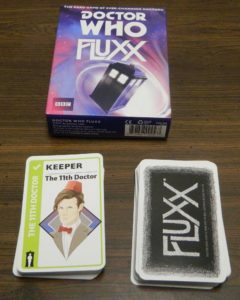 While the cards included with the game are different and have some unique abilities, the main difference between Doctor Who Fluxx and other Fluxx games is the theme. This is not that surprising as this is the case with most Fluxx games. If you are not a fan of the Fluxx franchise you probably won’t like Doctor Who Fluxx. If you like Fluxx and Doctor Who though I think you will really enjoy Doctor Who Fluxx. While I wish Doctor Who Fluxx would have included some unique mechanics not seen in other games in the Fluxx series, it doesn’t mean that the game is not enjoyable. While the game is not for everyone, I have always enjoyed the Fluxx series. There is just something enjoyable about a game where the rules are always changing and you have to adapt in order to win. For those of you who have never played a Fluxx game before, the simplest way to describe the game is a game fluctuating rules. Only two rules stay the same throughout the entire game. You will draw cards and then play cards. Every other rule in the game including how many cards you draw or play can change at any time. While the goal of the game always involves collecting certain keepers/creepers, what cards you are looking for can change at any time. So you would think that a game where the rules are always changing would be confusing. While it might take new players a couple rounds to adjust to the game, the Fluxx franchise is straightforward enough that I don’t really see players having many issues. The reason the game is straightforward comes down to you mostly just drawing and playing cards as you try to acquire the cards that you need to meet the current goal. The biggest complaint that most people have with the Fluxx series is that it is a game that relies heavily on luck and has very little strategy leading to the winner being kind of random. I will agree with these people that the game relies on a lot of luck. If you don’t get the right cards at the right times you have next to no chance of winning the game. With the reliance on luck Fluxx is a game that can take minutes or up to 30 minutes to complete. I disagree with these players some when it comes to strategy though. The Fluxx series is never going to be considered a strategic game but I think there is more strategy to the game than some people want to admit. The strategy of Fluxx comes from using your cards’ abilities together in order to set up the conditions you need to win the game. While you could easily luck into winning the game, wise use of your cards can give you an advantage in the game. While Doctor Who Fluxx plays a lot like the other games in the series, the cards have some interesting abilities. 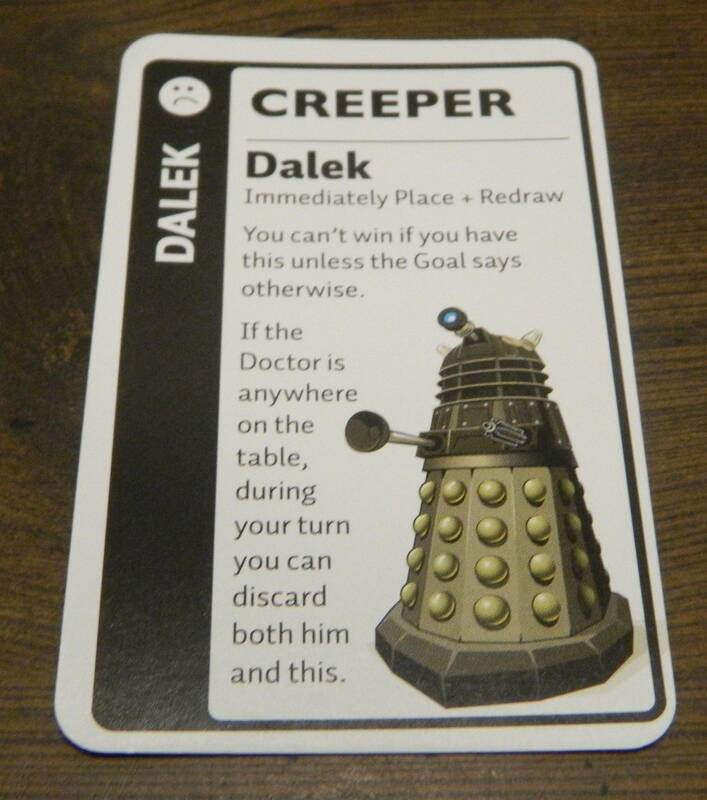 In addition to the new rule, keeper, goal, and action cards; Doctor Who Fluxx also implements the creeper and surprise cards introduced in prior Fluxx games. The game also gives some of the keeper cards special abilities that can help out the player that controls the card. While none of these mechanics are new to Doctor Who Fluxx, I think they are all nice additions to the game. The creepers might be the most interesting part of the game. Creepers are usually thought of a punishment as they can prevent you from winning a game that you otherwise could have won. With how many cards there are that let you get rid of creepers or move them to another player you would think it would be best to just get rid of them when possible. It becomes interesting though because there are actually a lot of goal cards that require you to have one or more creepers. The creepers are the perfect example of why I don’t think there are any “bad” cards in Doctor Who Fluxx. Every card has its own purpose that can lead you to victory. The concept behind the surprise cards are not particularly original as they are just cards that you can play on other players’ turns. What is interesting about surprise cards though is that they can be quite powerful. Keeping the right surprise card in your hand can help you stop a player that otherwise could have won. Players can also use surprise cards to block other players’ surprise cards. While there aren’t a lot of surprise cards they can lead to some back and forth between the players. While playing Doctor Who Fluxx one thing I kind of noticed is that the game seems to have a higher emphasis on goal and keeper cards than other games in the series that I have played. The distribution of the cards in Doctor Who Fluxx are as follows: 1 basic rule card, 5 surprise cards, 8 creeper cards, 16 new rule cards, 18 action cards, 25 keeper cards, and 27 goal cards. 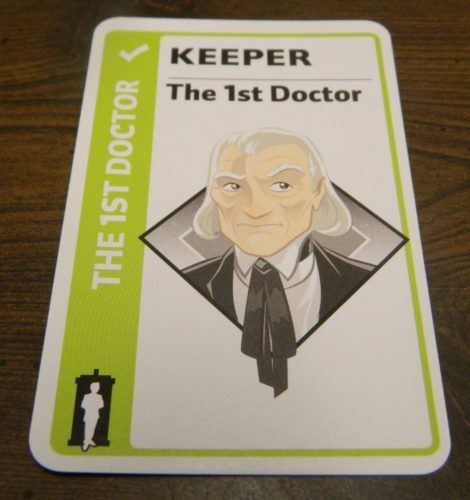 While I haven’t checked the distribution of other Fluxx games for comparison, it felt like Doctor Who Fluxx had more goal and keeper cards than other games in the series. This is not really a negative or positive just an observation that rule changes don’t seem to be a prevalent as they are in other versions of the game. 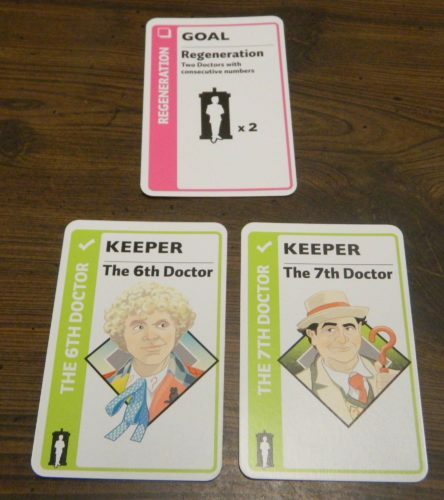 Note: After hearing back from Looney Labs Doctor Who Fluxx is more goal and keeper intensive than some Fluxx games. The distribution is similar to Star Fluxx (which I haven’t played yet). Doctor Who Fluxx does have the least number of rule cards in any Fluxx game though. As far as components, Doctor Who Fluxx is similar to the other games in the series. The game includes 100 cards like the rest of the series. The card quality seems the same. The artwork is styled like most of the other Fluxx games but obviously utilizes the Doctor Who franchise. If you like Doctor Who and the Fluxx art style I think you will really like Doctor Who Fluxx’s components. Should You Buy Doctor Who Fluxx? After playing quite a few different versions of Fluxx I had a strong feeling of what it was going to be like playing Doctor Who Fluxx. 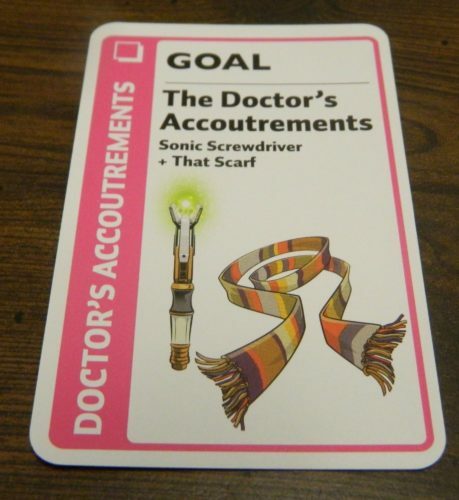 While the abilities on the cards differ from other versions of the game, Doctor Who Fluxx doesn’t contain any mechanics that haven’t been used in other versions of the series. Basically Doctor Who Fluxx is Fluxx with some small tweaks to fit the Doctor Who franchise. Like the rest of the series the game is quite simple and fun with the rules always changing. The game also relies heavily on luck but I think it still has some strategy. Basically if you have ever played a Fluxx game before you should have a good idea of what to expect out of Doctor Who Fluxx. The decision of whether to purchase Doctor Who Fluxx comes down to two things. First do you like Fluxx?If you don’t like Fluxx I can’t imagine you enjoying Doctor Who Fluxx as it basically follows the same formula as the rest of the series. If you have never played Fluxx before it comes down to whether you like the idea of the rules always changing. The other question is whether you like Doctor Who? If you don’t really care about Doctor Who and already own a game of Fluxx there is no reason to purchase Doctor Who Fluxx. If you like Fluxx and Doctor Who though I think you will really enjoy Doctor Who Fluxx. Does a good job adapting Fluxx to Doctor Who. Will appeal to fans of Doctor Who. Relies heavily on luck like every Fluxx game. Is not drastically different than the other games in the Fluxx series.